Natural light makes us feel good and now that the sun has begun to appear from behind the clouds of winter, there’s no better time to find new ways to let that natural glow flood your home. 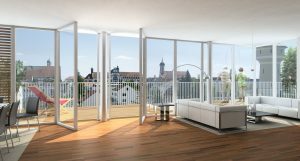 In the latest blog post by Williams Windows DG Limited, we discuss top tips for allowing more light to travel through your home. In 2017, a study revealed that natural light was one of the top features people looked for when buying a new home. However, if your house is positioned in such a way that limits the level of natural light you receive, don’t despair. Mirrors and reflective accessories offer stylish touches to any room and reflect light around a space. Furthermore, such items can also make the space feel a lot bigger and thus provide the illusion of more light. Light wall colours will reflect natural light, rather than absorbing it. To go a step further, you may want to invest in “light and space” paint which includes very fine light-reflective pigments to help diffuse light around a room, making it appear brighter and bigger. Your windows and doors may be the barrier to the natural light you crave. Bi-fold doors offer a floor to ceiling glass option to ensure the maximum amount of light can enter your home. Additionally, you may wish to change the partition walls in your home to more transparent options, ensuring a free flow of light through each space. The dedicated team at Williams Windows DG Limited have been offering a wide range of windows and doors to suit the style of your home for many years. From bi-folding doors to traditional styles and modern fittings, we are able to provide a wide range of windows and doors to help you create your perfect home. For more information our wide range of services, please call our trusted team on 0208 428 5433 or fill out our online contact form.